It’s just a simple grilled cheese sandwich. 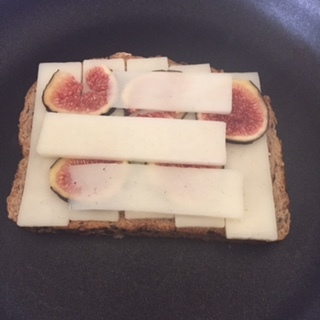 No special technique, just buttered bread cheese and… figs. Oh geeze, The Swearing Mom is using figs? AGAIN??? What is that, like three days in a row? Yep! And there’s even more to come! 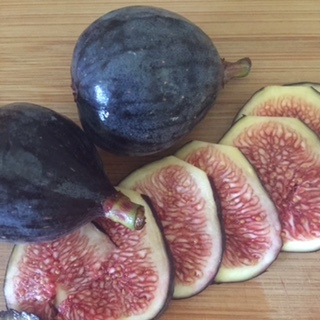 Figs are SO special! They’re like humming birds or shooting stars! They’re completely limited, special and temporary. If you blink, you might miss them. So, while they’re in, I’m doing figs! 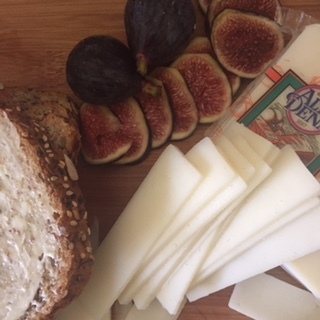 The other reoccurrence with figs, is the goat cheese. There’s just something about the combo that is complimentary magic. I went to my people, you know, my specialty foods ladies at the Whole Foods, and asked them for a goat that would melt well. They recommended this goat cheese by Alta Dena. It was delicious but not quite as melty as I would have liked. I think next time I would use a goat’s gouda. If you want a cow milk cheese, jack or havarti would be great! So, there’s no real “recipe” to speak of here. 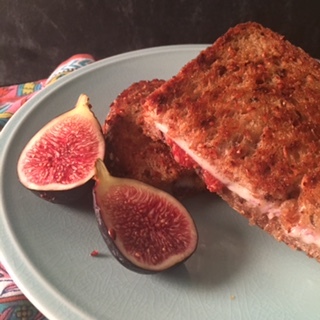 Just a simple grilled cheese sandwich with thinly sliced figs inside. Yep! That’s it! Buy a seed and nut filled bread, butter one side of two slices. 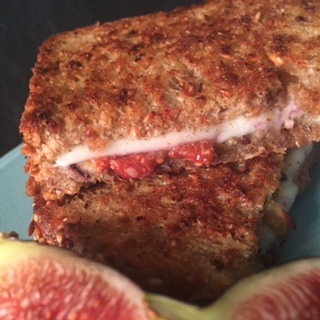 Add a layer of sliced cheese, a layer of fig (as much or as little as you like) and another layer of cheese. Butter sides of bread facing out and cook it slow and low until golden and crispy. Cut in half and serve immediately! Voila! We enjoyed the flavor combo here. It’s just a small addition that elevated a simple, comfort food staple. Enjoy!